2015 Bowman Baseball has some exclusive cards and autographs only available through their Twitter account. Topps has made 150 special packs intended for giveaways on Twitter. Each pack has nine special Blue Refractors as well as an autograph that's numbered to 3. The Refractors are different from the Blue Refractors included in packs and can only be found in the special Twitter packs. The autographs are also exclusives. 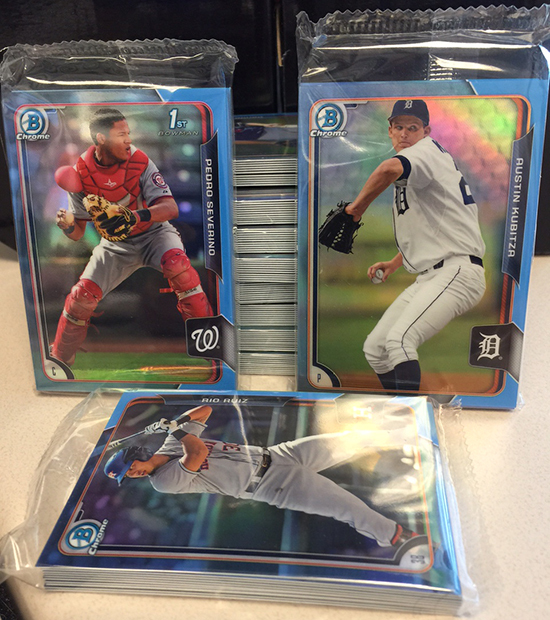 The Twitter Blue Refractors cover all 150 Prospects inserts included in 2015 Bowman Baseball. While Topps didn't release production numbers, with 150 packs of nine cards, there's likely about ten copies of each card if one of each is held back in case of condition issues. Topps has not announced exactly how the packs will be given away other than it'll be announced through their Twitter account.